Experienced workers hold substantial views about the kinds of work-learning experiences that will support and sustain their competence and employability development. These views, founded on years of generating and responding to the changes that characterise work, represent valuable sources of insight that can inform the provision of continuing education and training. 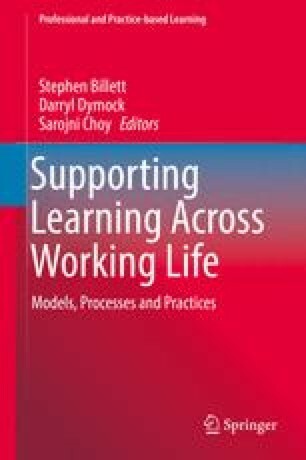 Further, these views evidence workers’ understandings and acceptance of work as increasingly bound in learning. In short, workers are highly informed and capable contributors to the learning needs that underpin their work and their employer organisations’ viability. These conclusions and some of their implications for continuing education and training provision are advanced here. The chapter draws on research with workers predominantly from four Australian industry sectors: mining, aged care, finance and services. Through interviews and surveys, these workers explained their work related learning experiences in ways that identified, evaluated and advocated how best that learning should proceed. Significantly, they discussed securing access to expertise and learning support that aligned with the social, performative and collective nature of work. Such goals can be realistically pursued only when worker engagement is high and learning support is well-resourced, and perceived as constituting a developmental trajectory. In more general terms, workers who participated in the research reported here valued, preferred and advocated work-learning experiences that bring together task authenticity, expertise and shared practice. They were very clear about the importance of learning in and for work and equally clear about how best they learned. Their elaborations of their work-learning experience suggests that in order to engage learners most productively effective continuing education and training must go beyond classroom training and immediate skills development. It must take a more expansive and learner centred focus on the kinds of changes and personal and organisational development requirements and circumstances that epitomise contemporary work practices. Funding and support for this project was provided by the Australian Government Department of Education, Employment and Workplace Relations through the National VET Research and Evaluation Program managed by the National Centre for Vocational Education Research. The views and opinions expressed in this document are those of the authors and do not necessarily reflect the views of the Australian Government, State and Territory governments or NCVER.